LONDON (AP) — Chelsea coach Maurizio Sarri will persist with playing N’Golo Kante in an unfamiliar advanced position in midfield despite acknowledging the France international has yet to settle in his new role. Kante, widely considered the world’s best holding midfielder, has a slightly more attacking role in Chelsea’s team this season as Sarri looks to accommodate a more creative deep-lying playmaker in new signing Jorginho. That appears to be limiting the effectiveness of Kante, while rival teams are beginning to target and stifle Jorginho because he is so influential to Chelsea’s style of play. That was particularly evident on Saturday when Tottenham overwhelmed Chelsea in a 3-1 win in the Premier League. Sarri was critical of Kante’s display against Tottenham, saying he “lost his position” and “wanted to solve the match … but in the wrong way.” He has no intention, however, of changing Chelsea’s midfield set-up to better suit the 27-year-old Kante, who signed a new five-year deal last week. Sarri previously has encouraged Kante to go forward in matches. “Maybe it’s only a question of time,” Sarri added about Kante adapting to his new position. 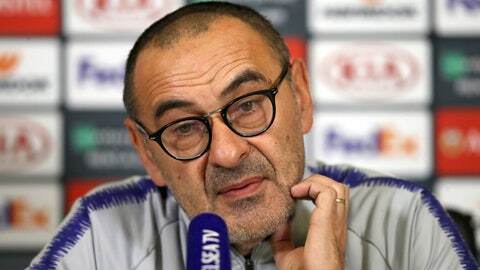 Sarri was speaking ahead of Chelsea’s Europa League game against PAOK Thessaloniki on Thursday. The English team needs just a draw to win Group L with a match to spare. Eden Hazard is unavailable while he recovers from a minor ankle problem.